Pizza-Baked Spaghetti returns to Fazoli's for a limited time and brings with it three new baked manicotti dishes. Pizza-Baked Spaghetti takes spaghetti noodles and tops them with special sauce, mozzarella, provolone, and pepperoni before baking. - Pizza-Baked Manicotti - Two hand-rolled manicotti topped and baked with special sauce, pepperoni, mozzarella, and provolone. - Chicken Alfredo Manicotti - Two hand-rolled manicotti topped and baked with Alfredo sauce, parmesan-roasted broccoli, roasted chicken, mozzarella, and parmesan-panko breadcrumbs. 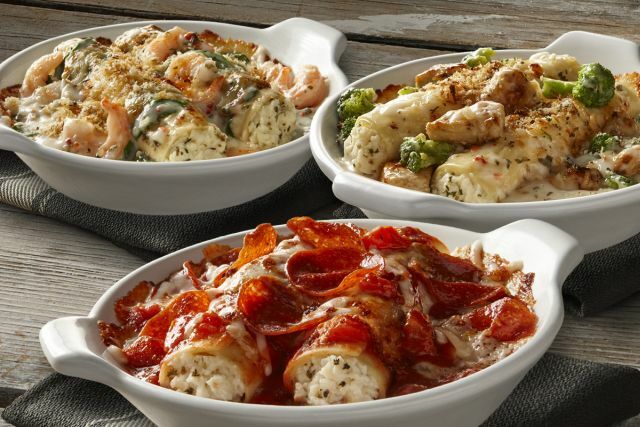 - Shrimp Alfredo Manicotti - Two hand-rolled manicotti topped and baked with shrimp, black pepper Alfredo sauce with spinach, mozzarella, and parmesan-panko breadcrumbs. The fast casual Italian chain also offers new Chocolate Hazelnut Cheesecake for a limited time. It consists of chocolate cheesecake topped with a layer of chocolate hazelnut spread and a chocolate hazelnut flute wafer.